Explore New Zealand's Antipodes and Sub Antarctic Islands on this 14-day expedition cruise on board Silversea's Silver Discoverer. Departing Auckland, on 22 November, 2014, Silver Discoverer will travel south, visiting White Island and Napier, before sailing to Chatham and Pitt Island. Silver Discoverer will then voyage to a number of New Zealand's most incredible Sub Antarctic Island groups including Bounty, Campbell, Enderby and The Snares. 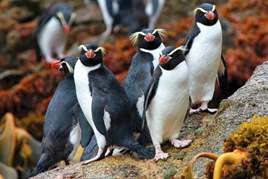 Guests will encounter an abundance of seabirds and marine wildlife including the Southern Royal Albatross, New Zealand sea lions, Crested Penguins and the rare Yellow-Eyed Penguin. Meandering the quiet and still channels of the Dusky Sound in Fiordland, guests will explore the surrounding steep cliffs and dense rainforests by Zodiac, followed by a nature walk at Ulva Island. This voyage ends in Dunedin, with guests disembarking on 6 December, 2014. Prices are per person starting from AU$11,050 in an Explorer Suite double occupancy. Silversea's fares include all shore excursions hosted by an expert expedition team; all-suite accommodation with butler service; gourmet meals with menus designed by Relais & Châteaux; complimentary wines, Champagne and spirits served throughout the ships; and all gratuities.